The Cape Field Artillery (CFA) Pipes and Drums, based in Cape Town, is homed in one of the oldest military regiments in the country. The Pipe Band practices and is based at the Castle of Good Hope in Cape Town. We can be booked for any size function, whether you want a single piper or the full band. 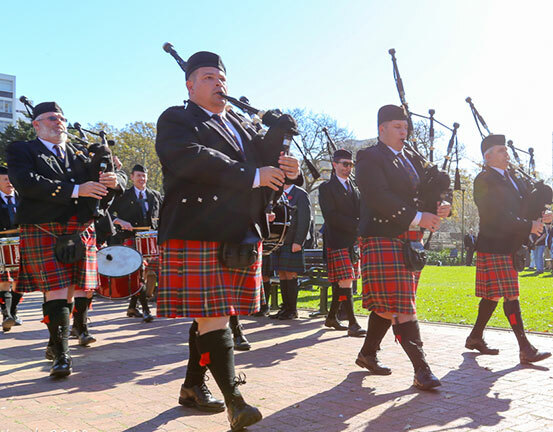 Based in the Western Cape, CFA Pipes and Drums is proud to play at the prestigious annual opening of parliament in Cape Town and at various functions, weddings and events. We play at all functions, weddings and corporate events and we can tailor the music specifically to suite your function. Piping and drumming tuition is offered for all ages. Learners are encouraged to perform, then after gaining experience perform with the band. Bagpipes turn any event into a special occasion. The band is made up of a mixture of members, from youngsters who have just started learning to more mature players who enjoy the magic of the Bagpipes. The band welcomes the introduction of new members. Hire us to add a Scottish Celtic feel and atmosphere to your next event with the magnificent sound of the bagpipes - be that a corporate event, birthday, social or wedding. Based in Cape Town, Western Cape South Africa, the Cape Field Artillery Pipes and Drums (CFA) historically dates back to 1952 when Corporal Piper Ken Langlands decided to form the Cape Town Stewarts School of Piping. He applied to the Royal Caledonian Schools as an affiliate member and was thereby also granted permission to wear the Royal Stewart tartan. The band is based at the Castle of Good Hope in Cape Town. Hire the band for your corporate function, wedding funeral or any special event. We provide free tuition so contact us to join our band. The Cape Field Artillery Pipes and Drums (CFA) historically dates back to 1952 when Corporal Piper Ken Langlands decided to form the Cape Town Stewarts School of Piping. He applied to the Royal Caledonian Schools as an affiliate member and was thereby also granted permission to wear the Royal Stewart tartan.